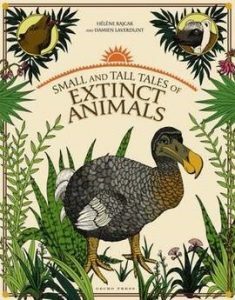 There’s a new trend in beautifully and imaginatively illustrated fact books for children. Here are some of our current favourites, mostly with a natural theme. All are hardbacks. 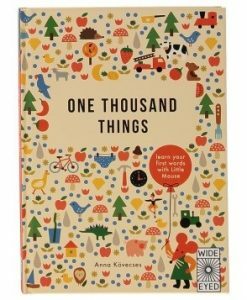 For very young children, One Thousand Things by Anna Kӧvecses (Wide Eyed Editions, £12.99) is a lovely introduction to first words and concepts. With bold, graphic illustrations in lovely colours, it is split into sections such as First Things to Learn, Things to do With You, Things Around the World, and has a cute mouse somewhere on every page. 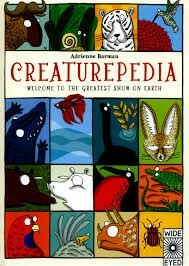 Creaturepedia by Adrienne Barman (Wide Eyed Editions £14.99) is for slightly older children (4-7) and has charming and often amusing illustrations of animals accompanied by facts relevant to the categories they have been divided into. 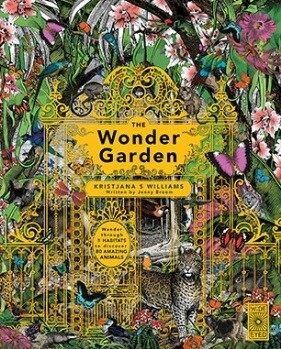 The categories themselves are an interesting and imaginative way of looking at the natural world, and include The Liliputians, The Homebodies, The Masters of Camouflage, The Champion Breathholders, The Big Mouths!